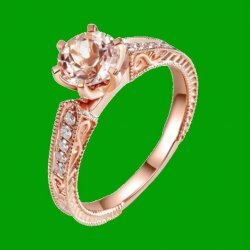 This lovely and beautiful Peach Morganite Round Cut Diamond Highlights Ladies Ring is expertly crafted in 14K Rose Gold. A beautiful elegant piece. Pretty, enjoy this Peach Morganite Round Cut Ring. Each ring features One (1) Round Cut genuine Peach Morganite Gemstone measuring 7.00mm in diameter. Each ring has ten (10) round shaped Genuine White Diamond Gemstones set around the main gemstone. Colour - H Clarity VS-SI Weight 0.13 carats. Presented in an elegant lined gift box. The gold metal weight of this pendant is 4.30 grams. The stone weight of the Peach Morganite and Diamonds is 1.33 carats.